Summit Racing Chevy 350 engine kit Pro Pack, Engine Rebuild, Cast, Flat, 4.030 in. Bore, Std. Rod, Std. Main, Chevy, 350,Stage II connecting rods with ARP 2000 cap screws, high volume oil pump with stock pickup, double roller timing set, brass freeze plugs, sealants and rod bolt boots. 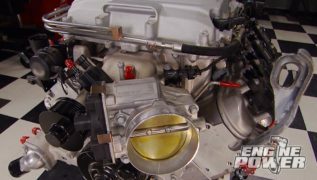 CHEVY BEING BUILT ON A BUDGET, AND VALUABLE TECH TIPS FOR TUNING A CARBURETOR. ON THE ENGINE DYNO. WELL WE'RE HERE TO SATISFY BOTH SIDES AND WE'RE STARTING WITH THE BASICS. WE'RE ALSO GONNA TAKE CARE OF THE GUYS THAT MIKE MENTIONED AND WE'RE GONNA DO THIS IN A THREE STAGE BUILD, AND WE'RE CALLING IT IN HOUSE POWER MOUSE. COMPLETE A SHORT BLOCK. THIS PRO PACK OIL PUMP AND PAN KIT WAS NEXT ON OUR LIST, FOLLOWED BY THE CAM AND LIFTER KIT, AND THE CYLINDER HEADS ARE ORDERED AS A PAIR AND EVEN COME WITH ROCKER STUDS AND GUIDE PLATES. THE REST OF THE GOODIES WERE ORDERED INDIVIDUALLY WITH DOLLAR SAVINGS BEING PRIORITY. 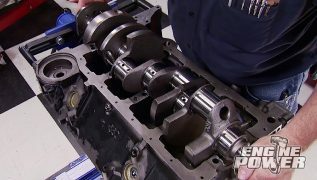 (PAT)>> INSTEAD OF THE HASSLE OF FINDING A GOOD BLOCK AND HAVING IT MACHINED, WE OPTED FOR THIS SUMMIT RACING FULLY MACHINED IRON FOUR BOLT MAIN LATE MODEL BLOCK. IT'S BORED AND HONED 30 THOUSANDTHS OVER, ALIGN HONED, SQUARE DECKED, AND CAME WITH CAM BEARINGS, FREEZE PLUGS, AND OIL GALLERY PLUGS ALREADY INSTALLED. NOT BAD FOR UNDER $700 BUCKS. YOU'D AT LEAST SPEND THAT AT A MACHINE SHOP. EVEN THOUGH IT'S NEW, IT STILL NEEDS TO BE WASHED. IT TO FINAL SPEC. REMOVE THE CAP AND USE THE SCALE TO FIND YOUR TOLERANCE. OUR READING IS BETWEEN TWO AND THREE THOUSANDTHS. NOW THE CRANK COMES OUT. AND WITH THE CAP INSTALLED AND THE BORE GAUGE SET TO THE CRANK'S JOURNAL, WE'LL VERIFY THE PLASTIGAUGE'S ACCURACY. IT MEASURES 27 TEN THOUSANDTHS, AND THAT'S WITHIN A HALF THOUSANDTHS OF OUR RANGE. ALL YOU DO IS REPEAT THAT FOUR MORE TIMES AND YOU'RE GOOD TO GO. SO IS PLASTIGAUGE ACCURATE IF YOU DON'T HAVE A SET OF MICS? IT IS IN MY BOOK, AND THE IMPORTANT THING IS THAT YOU'RE CHECKING CLEARANCES TO MAKE SURE THAT YOU'RE IN THE RANGE YOU NEED TO BE SO YOU DON'T BURN ANYTHING UP, WASTING YOUR HARD EARNED MONEY YOU SPENT ON THIS NEW BULLET. SINCE OUR BLOCK IS A LATE MODEL VORTEC SETUP FOR A ONE PIECE REAR MAIN SEAL AND OUR CRANKSHAFT USES A TWO PIECE ONE, WE'RE GONNA USE THIS REAR MAIN SEAL ADAPTER WE GOT FROM SUMMIT RACING. WITH THE TOP PIECE ALIGNED AND FASTENED DOWN I CAN JUICE UP THE BEARINGS WITH HIGH VISCOSITY ASSEMBLY LUBE AND CAREFULLY DROP THE CRANK INTO PLACE. THE CAPS ALSO GET THE SAME TREATMENT. THEN THEY'RE SEATED WITH A DEAD BLOW HAMMER. THEN THEY ARE ALL TORQUED TO 70 POUND FEET ON THE INNER AND 65 POUND FEET ON THE OUTERS USING ENGINE OIL AS A LUBE. FINALLY THE OTHER HALF OF THE REAR MAIN SEAL ADAPTER GOES ON. THE THRUST CHECKS OUT AT FOUR THOUSANDTHS. IF YOU DON'T HAVE A DIAL INDICATOR MAKE SURE THE CRANK MOVES FORWARD AND AFT A LITTLE BIT. WE'RE CONTINUING ON AFTER THIS. (PAT)>> WELCOME BACK TO THE STAGE ONE BUILD OF IN HOUSE POWER MOUSE, AND SO FAR IT'S GOING REALLY SMOOTH. WE HAVE THE CRANK IN FOR GOOD BUT WE STILL HAVE PLENTY OF PARTS FROM THE SUMMIT KIT TO PUT INTO THIS BUDGET BUILT SMALL BLOCK CHEVROLET. WE'LL ROTATE THE BLOCK TO THE UPRIGHT POSITION AND INSTALL THE CAM AT THIS TIME. IT'S A SUMMIT RACING SINGLE PATTERN HYDRAULIC FLAT TAPPET CAM THAT HAS 218 DEGREES AT 50 DURATION ON BOTH THE INTAKE AND EXHAUST. PLUS IT HAS 450 THOUSANDTHS OF VALVE LIFT AS WELL. THE LOBE SEPARATION IS A TIGHT 106 DEGREES. BE SURE TO USE THE INCLUDED CAM LUBE ON THE LOBES, WHICH HELPS ESTABLISH A WEAR PATTERN IN THE PARTS AND PREVENTS PREMATURE FAILURE. DO NOT USE OIL HERE. WHEN TALKING CAM STUFF, SINGLE PATTERN MEANS THAT THE INTAKE AND EXHAUST DURATION DEGREES ARE THE SAME. A SPLIT DURATION MEANS THAT THEY ARE DIFFERENT. NEXT UP IS THE DOUBLE ROW TIMING CHAIN ASSEMBLY. 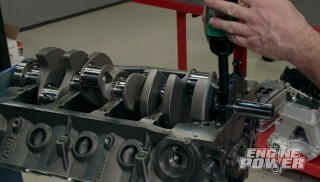 THE CRANK GEAR HAS MULTIPLE KEYWAYS TO DEGREE THE CAM IN WHERE YOU'D LIKE IT. A PIONEER ROLLER CAM BUTTON WILL KEEP THE CAM'S THRUST IN CHECK. IT'S NOT REQUIRED FOR A FLAT TAPPET CAM BUT THE ROLLER CAM IN STAGE TWO WILL NEED IT. SO WE'RE ALL SET UP FOR IT. THE BOLTS ARE TORQUED TO 28 POUND FEET. HEATER LIKE THIS. NOW THE SMALL END GETS HEATED UP AND EXPANDS SO THE PIN CAN FIT THROUGH IT. AS IT CONTRACTS IT LOCKS THE PIN IN PLACE. THAT'S WHY THEY CALL IT A PRESS FIT. NOW IF YOU DO THIS AT HOME WITH A TORCH, YOU ACTUALLY OVERHEAT THE SMALL END CAUSING DISTORTION. SMALL END IT'S READY. NOW WITH A PISTON AND PIN WAITING IN THE FIXTURE, ALIGN THE SMALL END WITH THE PIN AND USE A PUSHER TO INSERT IT. HOLD IT FOR ABOUT FIVE SECONDS AND THAT'S IT. NOW YOU WANT FREE MOVEMENT JUST LIKE THIS. THIS WILL PROMOTE MORE LOW END TORQUE SINCE OUR RPM RANGE IS LIMITED TO UNDER 6,000 RPM. WITH THAT DONE AND SOME LOCTITE SILICONE ON THE BLOCK, AN ALL STAR TIMING COVER FROM SUMMIT WILL SEAL UP THE FRONT OF THE ENGINE. SETS ARE NORMALLY PREGAPPED, BUT THEY STILL NEED TO BE CHECKED, ALL OF THEM. 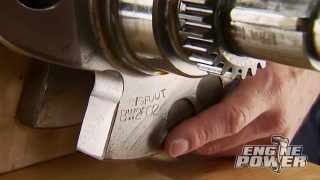 NOW WHAT WE'RE LOOKING FOR FOR THE TOP RING IS FOUR THOUSANDTHS GAP PER INCH OF BORE. SINCE WE'RE WORKING WITH A FOURZERO-30 BORE WE WANT AT LEAST 16 THOUSANDTHS HERE. NOW FOR THE SECOND RING WE WANT TO OPEN THAT UP JUST A HAIR MORE TO ABOUT 18 THOUSANDTHS. THE FIRST THING I'LL DO IS PLACE THE RING IN THE BORE, AND THEN USING A PISTON OR A SQUARING TOOL LIKE THIS, SQUARE THE RING UP. USING A 16 THOUSANDTHS FEELER GAUGE I'LL CHECK THE RING'S GAP. AS YOU CAN SEE IT'S A LITTLE LOOSE, WHICH ISN'T A BAD THING. BUT IF IT WAS TOO TIGHT, AS THE PISTON EXPANDS, THE RING GAP CLOSES AND BUTTS TOGETHER. 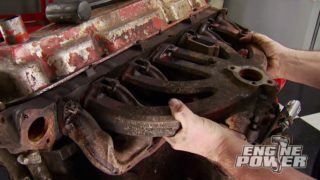 WHEN THAT HAPPENS IT'LL LITERALLY RIP THE TOP OF THE PISTON RIGHT OFF. NOW WE HAVE RIGHT AT 21 THOUSANDTHS, WHICH IS FINE. NOW THERE WON'T BE ANY NEGATIVE EFFECT WITH THAT LITTLE BIT OF INCREASE. IT'S PRETTY COMMON IN FACTORY TYPE RINGS. THE BEST PART, FOR YOU GUYS WITHOUT A RING FILER, THIS WORKS OUT PERFECT. NOW I'M GONNA GO AHEAD AND INSTALL THE RINGS ON ALL THE PISTONS AND GET THEM IN THE BORES. WE'LL BE RIGHT BACK. SFI BALANCER GOES ON NEXT, AND IT'S LOCKED DOWN WITH AN ARP CRANK BOLT. HERE'S A LITTLE BACKYARD TECH. WE DIDN'T HAVE THE CORRECT TIMING POINTER, SO WE MADE ONE WORK. BY FINDING TDC WITH A DIAL INDICATOR, WE MARKED THE POINTER AT ZERO, CUT IT WITH TIN SNIPS, BOLTED IT DOWN, AND BENT IT INTO POSITION. 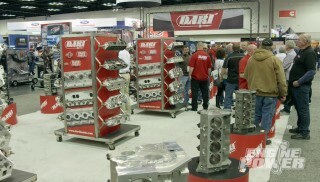 (MIKE)>> THE FIRST ITEMS FOR THE TOP END ARE THESE ALUMINUM SUMMIT RACING CYLINDER HEADS. NOW THESE ARE A VORTEC STYLE WITH 170cc INTAKE RUNNER AND A 69cc EXHAUST RUNNER WITH A "D" SHAPED PORT. NOW UNDERNEATH WE HAVE A 202 INTAKE VALVE AND A ONE-600 EXHAUST VALVE, AND THEY'RE BOTH SITTING IN A 62cc COMBUSTION CHAMBER. LOBE FOLLOWING, PUSH ROD LIFTING, VALVE OPENING APPARATUSES, OR LIFTERS. NOW THEY'RE HYDRAULIC FLAT TAPPETS. HERE'S AN FYI, THE BOTTOM OF THE LIFTER IS NOT FLAT. IT'S ACTUALLY ROUNDED. 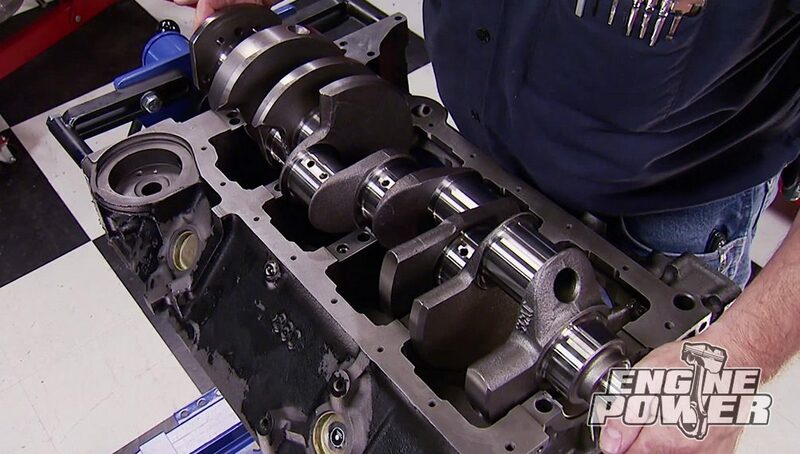 NOW THAT COMBINED WITH THE LIFTER CENTER BEING SLIGHTLY OFFSET TO THE REAR ABOUT 20 THOUSANDTHS KEEPS THE CAM SHAFT PUSHED TO THE REAR OF THE BLOCK. NOW THAT'S WHY THE CAM BUTTON UP FRONT WAS NOT NECESSARILY NEEDED FOR THIS STAGE LIKE PAT MENTIONED EARLIER. (PAT)>> STOCK LENGTH FIVESIXTEENTHS PUSH RODS ARE DROPPED THROUGH THE HEAD'S GUIDE PLATES AND REST ON THE LIFTERS. THESE ROLLER ROCKERS FIT THE BUDGET THEME. THEY'RE ALUMINUM FULL ROLLERS WITH A ONE POINT SIX RATIO. THEY COME WITH POLY LOCKS FOR LESS THAN $160 BUCKS. THE SETTING FOR THE INTAKE AND EXHAUST LASH IS HALF TURN PAST ZERO. THIS WEIAND ACCELERATOR SINGLE PLANE INTAKE MANIFOLD WILL TOP OFF THE HEADS. ITS OPERATING RANGE IS FROM 1,500 TO 6,800 RPM. (MIKE)>> THE REST WAS PUT ON IN HERE. SUPPLYING SPARK IS A PERTRONIX FLAME THROWER HEI WITH A MAGNETIC PICK UP AND MECHANICAL ADVANCE. IT PRODUCES 42 PERCENT MORE COIL ENERGY OVER STOCK HEI'S. 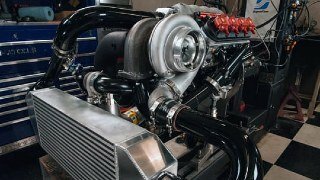 SUPPLYING FUEL IS A HOLLEY 650 CFM HP, AND PERTRONIX EIGHT MILLIMETER FLAME THROWER WIRES MAKE THE CONNECTION BETWEEN THE HEI AND ETHREE SPARK PLUGS. 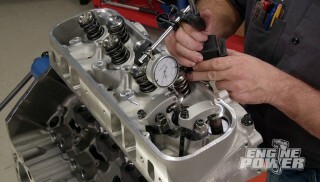 INCH AND THREE QUARTER DOUG'S LONG TUBE HEADERS ARE OUR CHOICE FOR THIS DYNO SESSION. WE'RE STARTING WITH 30 DEGREES OF TOTAL TIMING AND USING 93 OCTANE IN THE FUEL CELL. THIS ENGINE HAS A 10.25 TO ONE COMPRESSION RATIO. ALRIGHT, THE FIRST PULLS IS GONNA BE FROM 2,500 TO 4,800 JUST TO SEE HOW SHE ACTS. JUST KIDDING! WE HAVE TO TAKE A QUICK BREAK BUT WHEN WE COME BACK WE'RE DOING OUR FULL DYNO SESSION AND YOU'LL SEE THE RESULTS. (ANNOUNCER)>> PLUS HOW THE PROS TUNE A CAR. (MIKE)>> SORRY TO MAKE YOU WAIT. (MIKE)>> A SEWING MACHINE, SMOOTH AS SILK. 338 ON POWER, 388 POUND FEET, FLAT, FLAT TORQUE CURVE, STILL MAKING GOOD POWER AND CLIMBING. LET'S LOOK AT NUMERICALS. 4,800 IT'S ONLY DUMPING DOWN AT 370. (PAT)>> GOTTA TURN IT HIGHER. (MIKE)>> YOU WANT IT HIGHER, 6,000? HELD 377 POUND FEET FROM 4,000 TO 4,300. INCH DEAL WITH A FLAT TAPPET IN IT. WELL WE'VE GOT TO STAB SOME TIMING ON IT. (MIKE)>> THAT INTAKE NEEDS A LITTLE PLENUM VOLUME. (PAT)>> IT ABSOLUTELY DOES, AND I HATE CHANGING TWO THINGS AT ONCE BUT. (PAT)>> I THINK WE'LL DO TIMING AND SPACER. (MIKE)>> ALRIGHT, ONE INCH SPACER, 36 DEGREES OF TIMING, SAME RPM. 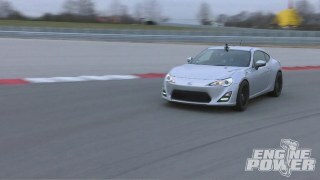 (PAT)>> KEEP IN MIND, THESE TBI ENGINES TYPICALLY MADE AROUND 200 HORSEPOWER FROM THE FACTORY. 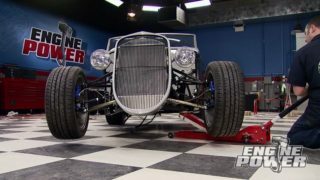 (MIKE)>> NOT BAD, NOT BAD, 357 ON POWER, 389 ON TORQUE. (PAT)>> THAT IS EXCELLENT AND EXCELLENT FOR CHEAP. THIS THING'S GOT GREAT VACUUM. THIS IS A 100,000 MILE ENGINE THAT YOU CAN PUT IT IN AN MANUAL, AUTOMATIC, IT WOULDN'T MATTER. THIS THING WILL RUN LIKE A SEWING MACHINE FOREVER. 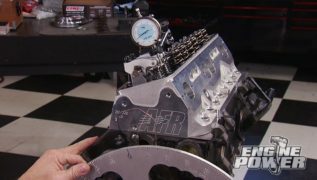 (MIKE)>> PEAK POWER, 357 AT 5,100, TORQUE WAS 389 AT 4,300 AND 4,400. 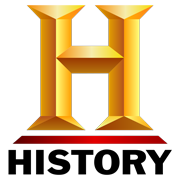 (MIKE)>> THAT'S A WINNER FOR THE MONEY. (PAT)>> NICE JOB! WELL YOU ASKED FOR IT AND YOU GOT IT. THIS IS STAGE ONE OF THREE AND IT WAS BUILT ON THE CHEAP. THAT'S ALL WE'RE GONNA TELL YOU FOR NOW. 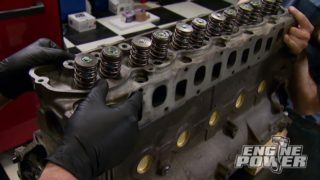 TRICK FLOW SPECIALTIES IS SURE TO PUT A SMILE ON ALL YOU BIG BLOCK MOPAR OWNERS WITH THEIR NEW CNC'ED POWER PORT 240 ALUMINUM CYLINDER HEAD. 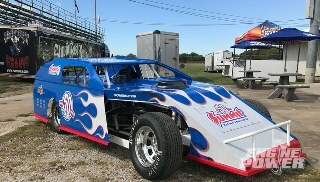 IT FEATURES A 240cc INTAKE RUNNER AND A 76cc EXHAUST RUNNER, AND IT ALSO HAS A HEART SHAPED 78cc COMBUSTION CHAMBER. THE VALVES MEASURE IN AT TWOONE-90 ON THE INTAKE AND ONESEVEN-60 ON THE HOT SIDE, AND THEY'RE COMPATIBLE WITH ALL PISTONS, ROCKER ARMS, INTAKE MANIFOLDS, AND HEADERS. AND THE PRICE FOR A COMPLETE SET IS ONLY ABOUT $2,000. COOLANT, ALLOWING MORE HEAT TO TRANSFER OUT SIDE TO THE RADIATOR, ALLOWING YOUR ENGINE TO RUN COOLER. NOW WHEN THE DIRECTIONS ARE FOLLOWED, THIS STUFF WILL ACTUALLY LOWER THE COOLANT TEMPS UP TO 22 DEGREES. NOW YOU CAN FIND IT AT ANY OF YOUR LOCAL AUTO PART STORES. (PAT)>> WHETHER YOU RUN RACE GAS, ETHANOL, OR METHANOL, MISTER GASKET'S GRAVITY FEED MICRO ELECTRIC PUMP WILL WORK FOR YOU. IT FEATURES STATE OF THE ART ELECTRONICS AND HAS NO DIAPHRAGMS OR MECHANICAL PARTS TO WEAR OUT. IT'S INTERNALLY REGULATED BETWEEN FOUR AND SEVEN PSI, AND DELIVERS 35 GALLONS PER HOUR OF FLOW WITH A SIMPLE TWO WIRE 12 VOLT HOOK UP. AND IT COMES WITH MOUNTING HARDWARE, A 100 MICRON FILTER, AND EASY TO FOLLOW INSTRUCTIONS ALL FOR AROUND $50 BUCKS. (MIKE)>> YOU GUYS ASKED THIS QUESTION A LOT THROUGH EMAILS AND TODAY WE'RE GONNA ANSWER IT. IT TAKES A LOT TO GET AN ENGINE UP AND RUNNING ON THE DYNO. THERE'S A LOT OF FACTORS INVOLVED. ONE OF THEM IS GETTING THE CARBURETOR SET UP AND TUNED IN SO THE ENGINE RUNS SMOOTH AND WE'RE IN A SAFE AIR/FUEL RATIO RANGE. WELL TODAY WE'RE GONNA SHOW YOU HOW WE DO IT. AND THIS GOES FOR A CARBURETOR THAT'S BRAND NEW OUT OF THE BOX OR MAYBE SOMETHING YOU'RE HAVING A LITTLE BIT OF AN ISSUE WITH. 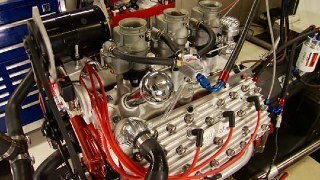 (PAT)>> WITH ELECTRONIC FUEL INJECTION FLOODING THE AUTOMOTIVE MARKET, SOME MAY THINK THAT CARBURETORS ARE A THING OF THE PAST. WELL I CHALLENGE YOU TO GO TO YOUR LOCAL DRAG STRIP OR CAR SHOW AND COUNT HOW MANY CARBS THAT YOU SEE. WHETHER IT'S A NITROUS CAR, A NATURALLY ASPIRATED DOOR SLAMMER, OR JUST A NICE HOT ROD, I BET YOU'RE STILL GONNA SEE PLENTY OF CARBS. 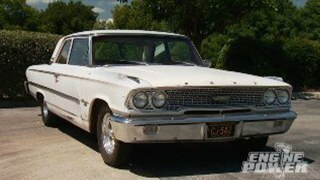 SMALL BLOCK CHEVROLET. SO I'M SURE A LOT OF YOU CAN RELATE TO IT. (PAT)>> OUR STARTING POINT IS SETTING THE ENGINE'S CURB IDLE SPEED, AND THAT'S DETERMINED BY THE PART SELECTION AND THE ENGINE'S PURPOSE. THIS CAM HAS A HYDRAULIC FLAT TAPPED WITH A DURATION OF 218 DEGREES AT 50. SO OUR TARGET IS GONNA BE 750 RPM. ONE FOR THE REAR. WITH THE ENGINE NOT RUNNING, WE'LL COMPLETELY CLOSE THE THROTTLE BLADES. THEN SLIGHTLY OPEN THEM ABOUT A QUARTER TURN. (PAT)>> THEN START THE ENGINE AND LET IT REACH OPERATING TEMPERATURE. BY TURNING IT CLOCKWISE, IT OPENS THE BLADES, WHICH DECREASES THE IDLE SPEED. COUNTERCLOCKWISE CLOSES THEM, DECREASING IDLE SPEED. OUR TARGET IS SET. THE IDLE MIXTURE IS NEXT. THIS CARB HAS A FOUR CORNER IDLE MIXTURE SETUP. WE LIKE TO RUN EACH SCREW IN UNTIL IT GENTLY BOTTOMS OUT. THEN BACK EACH ONE OFF ONE TURN AS A STARTING POINT. HOOK UP A VACUUM GAUGE TO A MANIFOLD VACUUM PORT, AND ADJUST THE SCREWS EVENLY TO ACHIEVE THE HIGHEST VACUUM READING. THE IDLE SPEED WILL INCREASE WHEN THIS HAPPENS. SCREWS ARE EVEN AND YOUR VACUUM IS AT ITS HIGHEST. THEN YOU CAN BACK YOUR IDLE SPEED DOWN BY TURNING THE MAIN IDLE SCREW FOR THE LAST TIME. USING THESE FEW SIMPLE TOOLS GETS YOU TO A GOOD POINT FOR THE REST OF YOUR TUNING, AND THAT MEANS DRIVING IT IF IT'S YOUR STREET CAR OR MAKING PASSES WITH IT IF IT'S YOUR RACE CAR, AND THAT MEANS CHANGING JETS AND AIR BLEEDS, AND WE'LL GET TO THAT ANOTHER TIME. (MIKE)>> WE HOPE YOU LEARNED SOMETHING OR MAYBE GOT A LITTLE INSPIRATION TO GET OUT IN YOUR GARAGE AND TRY THE SAME TYPE OF BUILD. NOW STAGE TWO IS GONNA BE PACKED FULL OF POWER. SO MAKE SURE YOU KEEP AN EYE OUT FOR IT. WE'LL SEE YOU NEXT TIME.